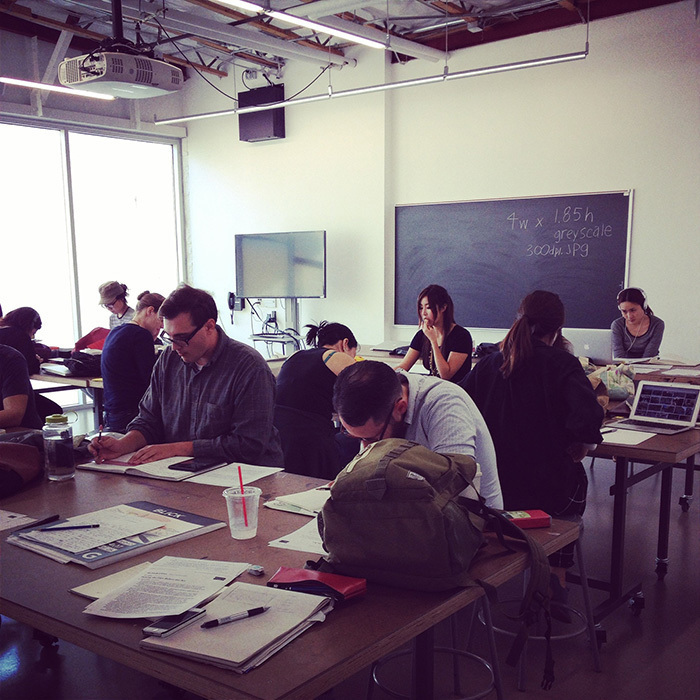 One of the pleasures of teaching at Art Center is a class I co-teach with the great Brian Rea called Op-Ed Illustration. 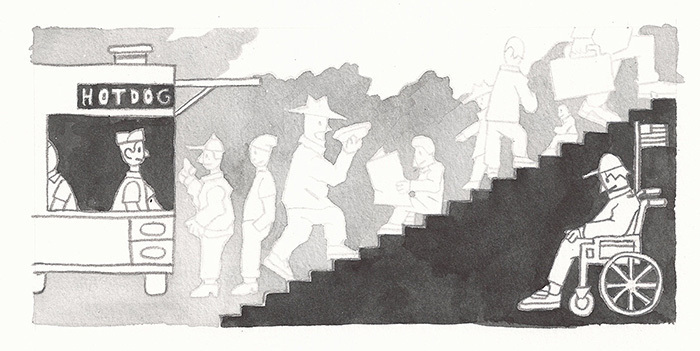 A few years ago when Brian told me he was leaving the grind of NYC and his spot as AD of The New York Times Op-Ed page for the equally treacherous streets of Los Feliz, I suggested we plan a class that would be a bridge from school to the real world for illustration students about to graduate. The concept of creating thoughtful illustrations that communicate an idea is not easy for students to grasp and the only way to get good at it is to make a lot of images. We try to duplicate for our students the procedure that illustrators who work for the Op-Ed page go through. That means we e-mail the article just before the class and expect to see 4-5 smart ideas the next day, we pick one and the final is due the next week. Not exactly the one-day turnaround that Op-Ed demands, but a lot quicker than students are used to working. We’ve had the generous support of the ADs at the Times who agreed to assign a live assignment each term. Students get the topic in class and sketch their ideas, we approve one and the final has to be e-mailed to Brian and me the next morning by 9am. We send them all to the paper, they pick one, and someone has their first piece in The New York Times the next day. This semester we had the pleasure of working with the great AD Nathan Huang who was a student in the first illustration class I ever taught about ten years ago. 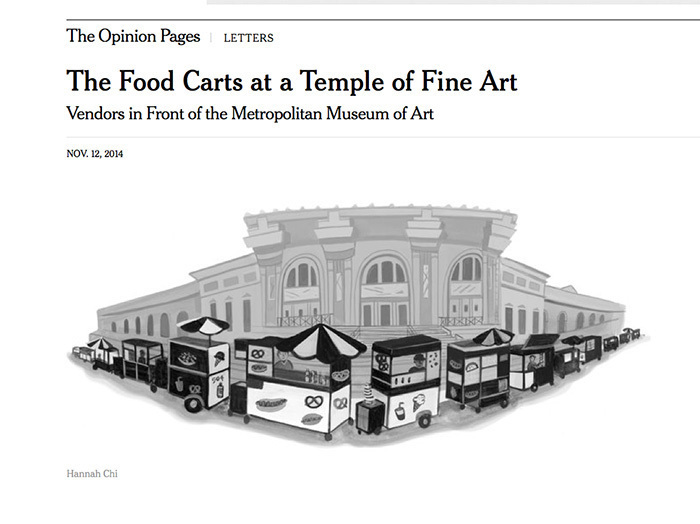 It was a Letters piece about the controversy surrounding the number of food carts in front of the Met. Brian and I always tell the AD, that if none of the students’ pieces are right, one of us will jump in and do the illustration, so far there has been no risk of that happening. How great. Higher stakes, greater demands. Brilliant concept and clearly wonderful results. Congrats all around. Great pleasure for me too buddy. BIG thank you's also to Aviva Michaelov, Matt Dorfman, Alexandra Zsigmond, Kim Bost, Leanne Shapton and the editors at the NYTimes for offering us such a special opportunity over the last few years. Wow - lucky students! These type of real world assignments are priceless for students. Especially for the NYTimes. Great post! I wish I had had this class. Loads of great work in these black & whites. What a bunch of great solutions. You guys are doing great work out there. I've tried to get my students to do Op-Ed-very difficult-but it's one of the best assignments to get them to think. I wish I had gotten this assignment. This was the assignment I had looked forward to since my first term at Art Center. One of the -if not- most exciting class assignments so far. I really can't imagine a better classroom experience, taught by better professors. So many solid, smart, witty, images here. You are an inspiration. such lucky students! These are great concepts and what a thrill for the chosen published ones.